Pressure cookers are very popular today, and for good reason. With busy schedules it is hard to put healthy good meals on the table some days, and owning a pressure cooker can really make a difference. 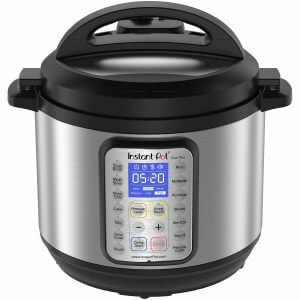 Pressure cookers, like the Presto pressure cooker, are not just for cooking beans or lentils, but for complete meals that will delight your entire family. Are Presto Pressure Cookers Modern? The model of pressure cooker we are reviewing today comes in two sizes. It can be purchased in a 4-quart size or the 6-quart size. If there are more than two people in your family you will probably want to check out the 6-quart Presto pressure cooker. The warp resistant aluminum used in fabrication is lighter in weight and less expensive than stainless steel. A word about stainless steel vs. aluminum construction: aluminum is a good conductor of heat and provides excellent cooking performance. Stainless steel on the other hand heats up fast and holds heat well which is why stainless steel is excellent for browning meat for stews and soups. It’s important to think about the cooking methods you prefer and the dishes you favor when deciding on the construction of your Presto Pressure Cooker. Are Presto Pressure Cookers Dishwasher Safe? Preferences of the chef aside, both types can be used on regular, smooth topped, or induction ranges. Both are dishwasher safe and carry a 12 year limited warranty. 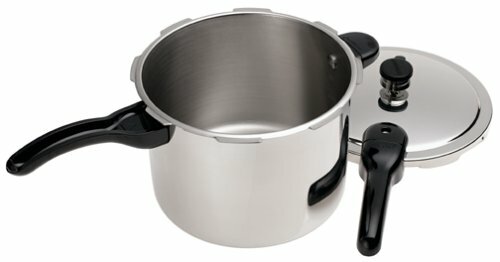 Presto Pressure Cookers can be used as a traditional soup pot and feature heavy duty lids that lock down during cooking. There are four safety features: an inner sealing ring that keeps steam in, a pop-up pressure indicator, a simple steam release mechanism, and an overpressure plug that will let off steam if it builds up too high. A word here about pressure cooking safety: the sealing ring should be removed after each use, and the inside rim of the unit should be cleaned thoroughly to guarantee proper sealing. Also, the gaskets should be replaced on a regular basis. This is true of any pressure type of cooking application. On the upside parts for the Presto are easy to find and easy to replace. The 16 and 23 quart deluxe Presto Pressure Cooker models double as a pressure canner as well. According to the US Department of Agriculture, pressure canning is the only safe manner of canning. Botulism is no joke, folks. If you’re a fan of canning, consider having a look at one of these. The rack fits down into the pot to keep jars up off the bottom so the liquid can circulate underneath the jars. One can also use both sizes as a boiling water canner for preserving fruits, jams, jellies, and pickles in pint and half pint sizes. If Grand Ma didn’t have a Presto, she was probably waiting on one. When cleaning your Presto pressure cooker you want to use nonabrasive cleaners. You can even use a fine metal polish on the exterior if you want to help keep its shine. You can totally immerse the unit when cleaning and it will not damage it in any way. You will need a small brush or pipe cleaner to clean the vent pipe and free it from any food debris. It is also important to always remove the sealing ring after each use so you can clean it and clean inside the rim of the lid as well. When cooking with the Presto pressure cooker be sure and read the enclosed booklet before using. There are detailed instructions inside along with any special safety issues you need to know. The only big issue with pressure cookers is to make sure the pressure is out of the cooker before opening. This is easy to know when using the Presto brand and you should not have any problems with this at all. The six quart weighs only seven pounds and the dimensions are 19 x 9.9 x 9.8. Presto ranks #1 in Kitchen & Dining cookware for pressure cookers on Amazon. Has cover lock indicator to show when there is still pressure inside the cooker. Helper handles for ease of handling. Comes with extended 12-year limited warranty. 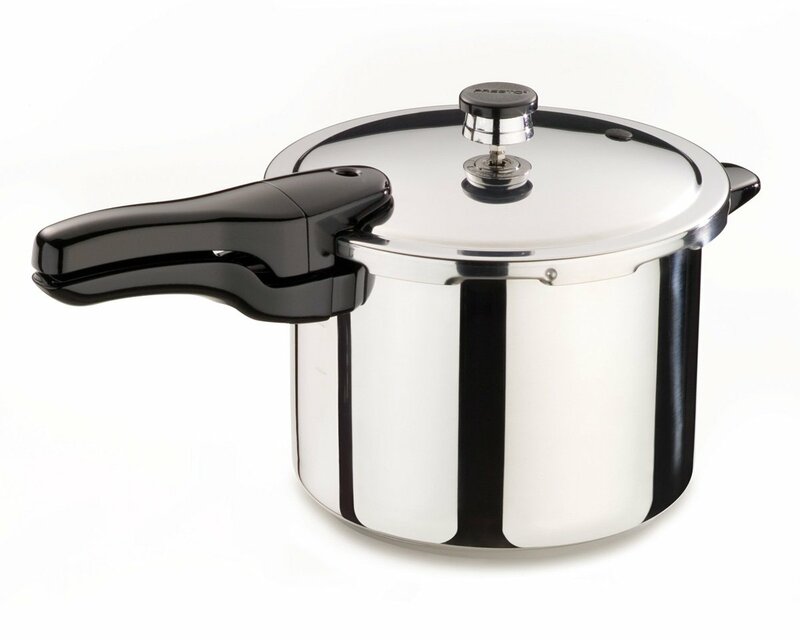 The Presto pressure cooker is very popular because the lid is heavy-duty with a good sealing ring that keeps in the steam. There is also an overpressure plug that is for your protection. It will let off steam if for some reason it builds up excessively. You will love the booklet that comes with the Presto pressure cooker because it contains over 65 recipes for you to get started with right away. These range from soup to entrees, and even vegetables. It is faster than most microwaves and cooks your foods without losing any moisture. Research shows that almost everyone who has purchased the Presto pressure cooker really loves it. Some of their remarks are paraphrased as follows. The plastic handles are strong and sturdy. The stainless steel is great for browning meat. It’s safe because it won’t open while still under pressure. Lightweight and easy to carry to sink. There is no product on the market that everyone loves and to give you a clear picture of how the Presto pressure cooker feedback truly is, we also looked to see if there was any negative feedback by customers. There was only one complaint found but it was mentioned by more than one customer and that issue was about the screws in the handles. Some people complained that they began to rust after time. However, another customer explained that if you dry the pressure cooker very well after each cleaning this problem can be avoided. So letting the cooker air-dry is probably not a good idea. The Presto pressure cooker has the ability to cook some really fantastic dishes in really quick time. It comes with 65 recipes ready for you to get started the very first day. Feedbacks from people who have used this model are extremely favorable and appear to back up the manufacturer’s claim of a great cooker.